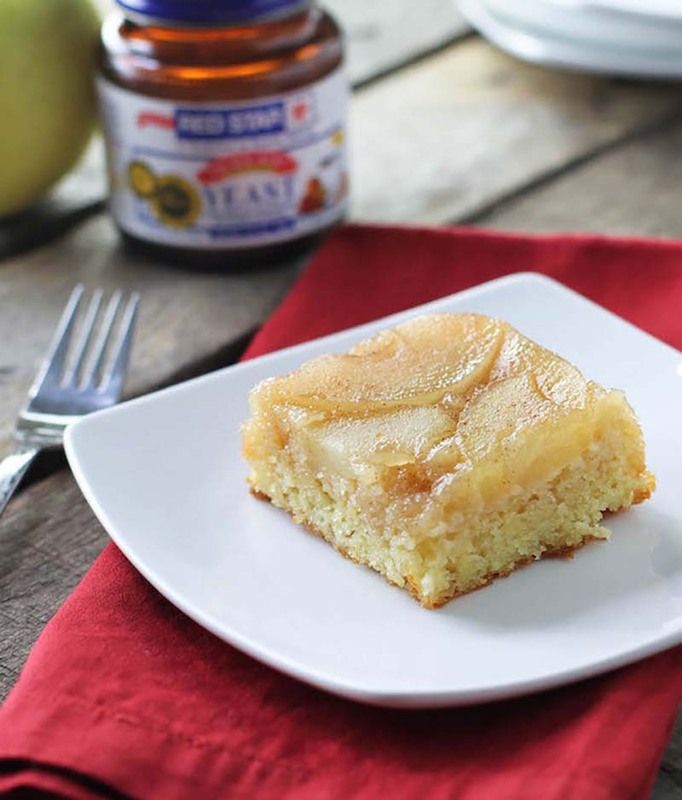 An autumn apple cake that’s perfect for an afternoon snack or for serving guests. Measure 1¾ cups of the flour into a large mixer bowl. Add the yeast, blend; set aside. Measure water, milk, butter, sugar and salt into a pan. Heat until warm (120°-130°F), stirring constantly. Pour into flour-yeast mixture. Add eggs. Beat ½ minute with electric mixer on low speed, scraping bowl. Beat 3 more minutes at high speed. Stop mixer. Blend in the rest of the flour, currants, and extract. Cover bowl. Let rise in warm place until doubled, about 45 to 60 minutes. While rising in the bowl, prepare Syrup and Topping: Blend sugar and water in a saucepan Bring to a boil, then simmer 5 minutes, stirring occasionally. Add lemon juice. Pour 1 cup syrup into a small pan for later use. Add apples, lemon rind, and cinnamon to saucepan with remaining syrup. Simmer 2 to 3 minutes more until apples are tender. Add the butter. Pour into buttered 9 x 13-inch pan. Pour raised batter over apple-mixture; spread evenly. Let rise again in warm place, about 25 to 25 minutes until doubled. Bake 35 to 40 minutes in preheated 350°F oven. Place on rack. Prick cake with fork. Pour warm (reheat if necessary) syrup over cake until absorbed. Cool slightly. Loosen edges of cake. Place rack over top and invert on flat plate or tray. Cut into squares; or cut in squares in pan and serve upside down, topped with whipped cream. This recipe is featured at Food Babbles. Made this twice and it came out great. Did not have to tweak anything and my tasters gave it five stars.